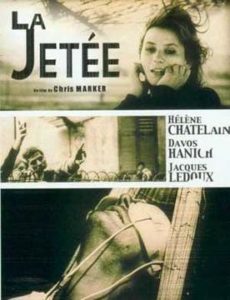 Chris Marker’s short sci-fi film La Jetée is one of the most remarkable in the genre. The plot is beguiling and the form of the film itself is utterly unique. The basic story involves a hazy childhood memory of the main character in which he was on an observation deck of an airport and remembers seeing a woman and incident involving a man, which he later realizes was the man dying. A third world war occurs, involving nuclear weapons that produce fallout rendering the surface of the planet uninhabitable. The survivors — presiding over a “kingdom of rats” — live in underground galleries below the destroyed remains of Paris. Scientists conduct time travel experiments on prisoners of war. The main character, who was a soldier during the war, travels back in time and meets the woman from his childhood memory. Then he is sent into the future, to try to enlist their help to save humanity of the present. People from the future eventually send him to the past to be with the woman again. But as he runs to her, he is shot by an agent of the present day “experimentators” who followed him into the past. He realizes that his childhood memory was of him witnessing his own death. This time travel story became the inspiration of the later feature-length film 12 Monkeys. The form of the film is even more remarkable than the story. It is almost entirely made up of still photographs artistically edited together. There is just one shot of moving film, showing the woman waking up and blinking. A narrator provides a voice-over throughout the film. There is also music (Euro-classical) and sound effects. But the shots break suddenly, or other times dissolve into each other. The narration and music and sound effects begin and end meaningfully. All of these things are part of the montage, which is astonishingly sublime. The gritty interpretation of the future was greatly inspiring to the so-called cyberpunk subgenre. Marker was a a multi-media essayist. His friend Alan Resnais had wanted him to work on something with him related to nuclear war in the late 1950s. Marker had to back out, but Resnais project ended up being Hiroshima mon amour (1959), with a screenplay by Marguerite Duras. But the theme of nuclear war reappears in La Jetée. Marker’s film is a swirling vortex of regret, loss, hope, rebirth, deception, love, technological horror, and utopian harmony. A curious part of the story is the way the main character (never given a name) reaches a cautious future society that seems to be flourishing, but he does so from a dystopian present with human society at its nadir. The question is how to break the Gordian knot in which the present seems to make the utopian future possible (The Man Who Fell to Earth would later explore similar themes). What separates this film from so many others is that it suggests that the time travel technology is not what enables the great society of the future. Rather, it implies that human connection is the more important aspect, even as the plot ends with the connection between the two main characters being broken with the man’s assassination. Although often described as being about a “time loop”, the film is open to many interpretations. Perhaps Roland Barthes’ comment a few years later in Criticism and Truth (1966) is apt: “a work is ‘eternal’ not because it imposes a single meaning on different men, but because it suggests different meanings to one man…” One such interpretation is to look at the film from the perspective of philosopher Alain Badiou‘s concept of an “event”. To simplify this concept, an “event” seems to exceed its causes, and becomes apparent only in hindsight as something new emerges from the multiplicity of possible meanings. It is not unlike a point made in Jorge Luis Borges‘ essay “Kafka and His Precursors” that a great writer’s work establishes his or her precursors in a way that “modifies our conception of the past, as it will modify the future” — an appropriate analogy here given the similarity in tone of Marker’s film and much of Franz Kafka‘s best writing. There is also something similar in the story line of La Jetée and the later comic book series The Incal by Alejandro Jodorowsky and Mœbius, which deals with the difficulty of breaking out of repetition and fatalism, and with heroic self-sacrifice for a greater good. This is one of the greatest sci-fi works of the 20th Century, in the same category as Lem‘s Solaris (1961), Le Guin‘s The Dispossessed (1974), Lang‘s Metropolis (1927), and such.